The fiancé told me the funniest story today. But before I can tell you the story, you need a bit of background. 1) The fiancé was in a relationship for 5 years that ended about 4 months before we met. He ended up writing a song about her called the Wrath of Kneecoal. It’s a very good song, one of the best of the 10 he’s putting on his jazz CD he’s about to put out. 2) I’ve only met her once. It was at one of his gigs down in St. Louis, near where she lives. I didn’t make a good impression (not that I cared). He played her song and introduced it as “being influenced by a friend of his that can be quite scary when she’s angry or fussing.” A friend at the next table leans over and asks was the song about me. She was sitting at the table behind me so I throw a thumb over my shoulder in her direction and say, “Hell naw! The song is about her.” She didn’t appreciate that. I was all, whatevs, the song is about you and your anger. 3) The fiancé and his ex are trying to be friends. I think this is okay because I believe she doesn’t want him anymore and he certainly doesn’t want her anymore, so if they think friendship is a good idea, go for it. They’re also friends on Facebook. Part of the reason this friendship is only mildly successful is that almost every time they talk, she says something that upsets the fiancé and reminds him why they aren’t together anymore. So on to the story. The fiancé puts up a Facebook status that says something to the effect of: “It really grinds my gears when random musicians advertise their music/gigs/albums on my Facebook page without asking first.” A couple of his friends agreed. After all, who wants unwanted crap from random folks on their Facebook wall? Nobody, that’s who. 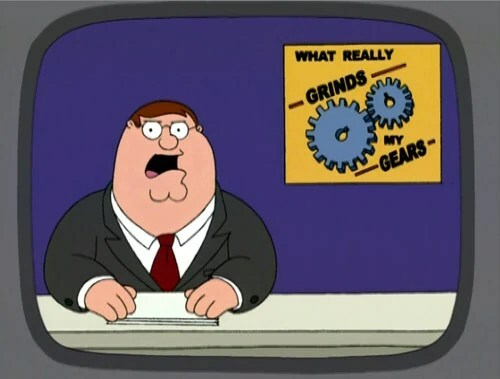 Of course, most people loved the Family Guy reference to gear-grinding. If you don’t know what I mean, Google “Grind My Gears”. When the fiancé told me that story, I was dying laughing. This friend of his that wrote that comment is bass player on the recording of the song. When the guys were first practicing the songs, they didn’t really know the story behind all the songs. The fiancé explained this particular song to them, so they have several examples of how she can be and how she tends to treat the fiancé. Having someone come back at you on Facebook quoting a song title written about how horrible you are is a bit cruel, but goodness it’s funny! This entry was posted on December 27, 2011 by Chicago-Style Girl. It was filed under Music, Romance and was tagged with crazy story.